EN ISO 9239-1, Reaction to fire tests for floorings – Part 1: Determination of the burning behaviour using a radiant heat source. Classification according to Euroclass A2fl, Bfl, Cfl or Dfl for floorings according to the European System. Other test methods are also used, see data sheet EN ISO 11925-2 and EN ISO 1716. Declaration of floorings fire characteristics for other reasons, for example insurance purposes. Flame spread, smoke production and the heat flux towards the flooring surface that is essential for flame spread is measured according to the test method. All types of flooring, for example those comprised by fire regulations and included in the European Construction Product Directive, CPD, for example wood floor, plastic floor, rubber floor, linoleum floor etc. The test specimen is placed in a horizontal position below a gas-fired radiant panel inclined at 30° where it is exposed to a defined heat flux. A pilot flame is applied to the hotter end of the specimen. Following ignition, any flame front which develops is noted and a record is made of the progression of the flame front horizontally along the length of the specimen in terms of the time it takes to spread to defined distances. 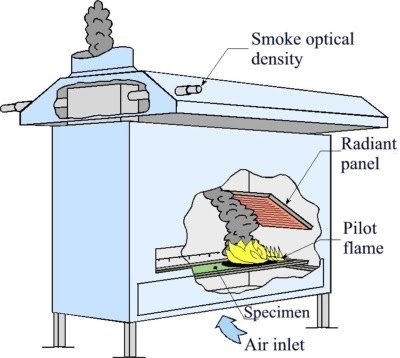 Smoke production during the test is recorded as light transmission in the exhaust stack. One specimen is tested in one direction (e.g. production direction) and one specimen in the direction perpendicular to the first test. The test which yields the worst results is repeated twice in that direction, i.e. a total of four tests. Similar tests, DIN 4102-14 and ASTM E 648.